Mix the cocktail ingredients and serve immediately. For the baskets: Unroll the dough into a large rectangle on a clean work area. Make a rectangle about 12x9 inches in size, firmly press on the perforation to seal. Cut the dough into 12 squares. Place them in muffin tins and apply pressure to stick to the bottom and sides. Bake for 15 to 20 minutes or until browned. Let cool for 5 minutes, remove from the mold and set aside. Mix the ingredients for the tuna salad in a bowl and fill each basket. Add one shrimp to each basket and decorate with chili powder, parsley or cilantro. 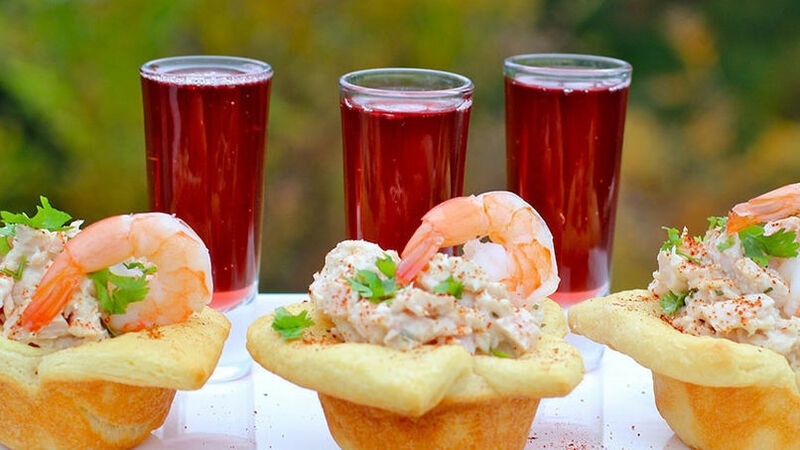 You can also use crab salad and the cocktail can be prepared without alcohol for children by using sparkling apple cider. These recipes for an appetizer and cocktail are quick and easy to make, and I’m sure they’ll make a great addition to your special celebration. This pair is an ideal way to toast to the new year. Everyone will like the contrast of puff pastry with tuna salad, creating the perfect appetizer for whatever dinner and it’s great with this cranberry sparkling cocktail. This recipe is very inexpensive, since the filling for the baskets is made with tuna. However, I do like adding shrimp as garnish.